In recent months, Voice Search has been dominating industry headlines. It ties Search together with some of the hottest gadgets on the market, so naturally, it’s captured our attention. But is it the most important development for SEOs and digital marketers to be focusing on? 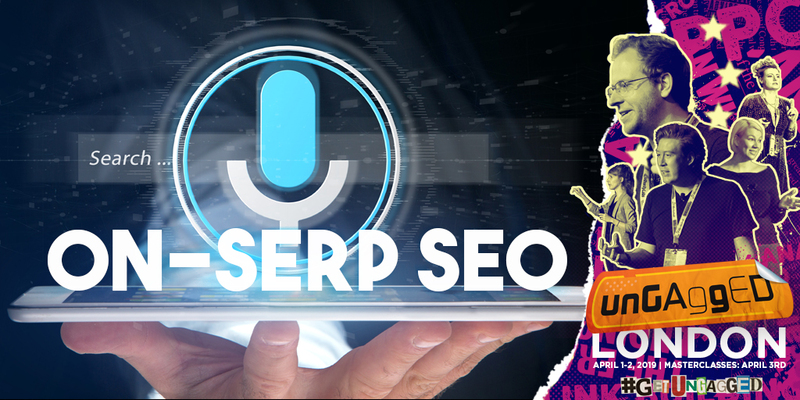 We all know that digital assistants only provide single search results (cue a horde of keen SEOs jumping to grab this opportunity), which means that, for those of us who are paying attention, the challenge of optimising for voice starts with on-SERP SEO. Google has the market share in many demographics, so they can do what they want with their SERPs to make the most money – it doesn’t really matter if they piss off poor little marketers anymore because they have brand loyalty. But these changes now mean that 47.04% of queries result in no-click searches, and there are only 15 organic clicks for every paid click, down from 20 a year ago. Before Google eats your entire lunch, take the time to step up your on-SERP SEO game, find those opportunities, and keep some of that converting traffic. SEO is all about taking steps to rank in the top 10 (or so) in the search results. But, search engines are constantly evolving and the days of 10 blue links are way behind us. You might have heard Clark Boyd speaking about this at UnGagged Las Vegas, in 2018. These days, organic rankings are sitting beneath ads, maps, news, media, featured snippets, or some combination of the above. The much coveted position zero that the featured snippet created isn’t really position zero anymore. Now, position zero is more like position 5 or 6 – and that’s if you’re lucky. As if that wasn’t bad enough, the CTRs are demoralising too. When there’s no featured snippet, 26% of clicks go to the first URL. It’s not the biggest chunk, but at least it’s a little more than a quarter. But this drops significantly when there is a featured snippet; 19.6% of clicks go to the first organic result, and 8.6% of clicks go to position zero. The only reason this percentage isn’t higher, is because these snippets often answer questions directly, resulting in a no-click search. Nowadays, It’s not enough to just have a decent meta-description. We’ve got to compete with flashy ad results and a ton of information. Without competing in the ad space, we either feature in the stuff that Google prioritises (which means people are likely seeing your content without the traffic, or we have to hope users remember to scroll beyond. How do we face the challenge of on-SERP SEO? Anyone who is worth their salt in the SEO game won’t balk at this development. Change is the only constant in our industry, that’s what keeps it fresh and exciting. So saddle up, and let’s get ready to tackle the next big thing in digital marketing. On-SERP SEO requires a mindset shift. Rather than just focusing on ranking on page one, it’s more important than ever to appear on search results that people actually click. So rather than tackling keywords with search volume, we need to be targeting those with real click potential. It’s all well and good to rank for a keyword, but if it’s a query that can be answered by a featured snippet or knowledge panel, you aren’t going to reap the rewards. Use your favourite keyword tool to find out which longer-tail keywords have a decent CTR and focus your energies on ranking for them. 2k Monthly searches won’t matter if Google is keeping them all for themselves. But before we get too obsessed with long-tail ranking again (time to take out the ol’ 2008 playbook? ), make sure you’ve nailed all the usual traffic opportunities.You still should be optimising for Local with Google My Business, images, and Google ads can give you that extra exposure on brand terms. Use every opportunity to get on that SERP. What has this got to do with voice and visual search? Methods of searching are evolving. Voice and visual are the newest to come along, but they still rely on SERPs which means they are giving us another opportunity to optimize and compete. With those quick-wins under your belt, you can move onto to the meatier stuff: controlling how your brand comes off. Now that there’s such a range of search result types, it’s easy for your content to be taken out of context by Google. The algorithms choose which parts of your content will display in the SERPs based on what they deem to be the most useful to their audience (not yours). This is great for the user, but couldn’t be risky for you. Now, more than ever, it’s so important to be consistent, recogniseable, and push your brand. There have long been discussions about the impact that branding can have on your SERPs – it shouldn’t come as a surprise that using branding and SEO hand-in-hand can have killer results. But with recent developments, branding is becoming your secret weapon and you’ve got no choice but to leverage it. Think about it; users click on the links of the brands they know and trust. So if the SERPs are becoming more crowded, your brand has got to become better known and more trusted. You’ve got to build on, and improve what’s already doing well if you want to play Google’s game. Claim your Google panels, create content for the platforms that they are biased towards. Guest post and sponsor content on sites that are ranking above you. If Google are going to play hardball, then so are we. When it comes to visual search, you’ve got to have a jumping off point: a visual identity. If your brand includes strong imagery that audiences and customers can associate with you, then you’re creating a sub-conscious connection. This connection is more and more essential as visual search gains popularity, so assess your visual identity and tighten it up now. Think outside the alt tag and make sure you’re optimizing your images to the fullest. Image optimisation is useful for all SEO activity, but if you’re not taking a cohesive, strategic approach to your images, you’ve got no chance to rank for visual search queries. Take it one step further by creating an image XML sitemap to help search engines understand what images are where on your site. The good news is that everything you’re already doing will still be useful. So keep up the hard work. By adding a few extra techniques, and honing the things you’ve been doing so well already, you’ll be ready to face this new challenge head on. Is schema markup the new SEO?